These were the unmistakable words of a pilot who consulted on the development of the technical standard for pilot watches (TESTAF) in reference to the importance of having a compulsory clock installed in aeroplanes. Depending on the circumstances defined by the manufacturer, operator or approval authorities, a cockpit clock malfunction can restrict in-flight operations and even cause significant financial losses. It was with all of this in mind that the priority for further development of the TESTAF for DIN 8330: pilot watches was to ensure that a DIN pilot watch could be a suitable all-round replacement for the mandatory instruments for time measurement in an aeroplane. The German DIN standards for the watch sector have been held in the highest regard both domestically and internationally for many years. At the request of Sinn Spezialuhren, and with the help of their intensive cooperation, DIN 8330: timekeeping technology – pilot watches became the first brand-new German watch standard to be developed in decades and was finally launched in 2016 within the framework of the DIN working group for pilot watches. This standard defines the requirements for functionally safe and reliable pilot watches for use in institutional, professional and civil aviation. 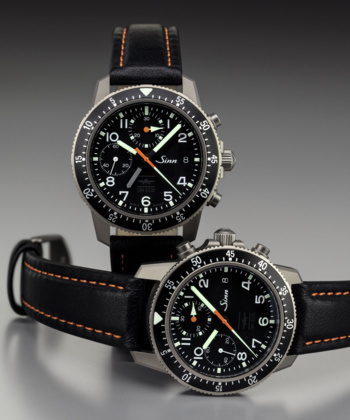 Sinn Spezialuhren has decades of experience and expertise in the domain of pilot watches, and by setting itself sophisticated new technological challenges such as this along the way, it is clear that the company shows no signs of stopping. 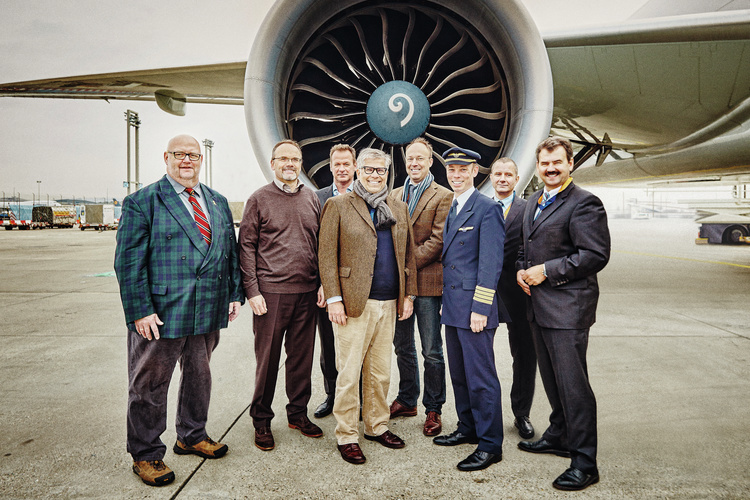 The pivotal members of the pilot watch working group (from left to right): Dr Martin Hoch (head of the working group for DIN 8330), Karl Wenzelewski (DIN), Volker Bau (Airbus Helicopters), Arno Gabel (Sinn Spezialuhren), Dr Wolfgang Schonefeld (Sinn Spezialuhren), Wolfgang Raebiger (Lufthansa Cargo), Maik Gagern (DNV-GL), Prof. Dr Frank Janser (Aachen University of Applied Sciences), not pictured: Jörg Schauer (Stowa). The DIN 8330 standard takes the uncompromisingly high demands placed on aircraft and helicopter equipment and applies these to wristwatches. Various measures are taken to ensure that a DIN pilot watch is not only a suitable all-round replacement for the on-board timekeeping instruments available to pilots, but is also capable of remaining unaffected by the physical stresses of flight, posing no risk potential for the crew or aircraft, and demonstrating compatibility with other on-board instruments. Only pilot watches that meet all the requirements of DIN 8330 are permitted to bear the familiar DIN label. Until now, there have not been any comparable or similar regulations to DIN 8330 to define the requirements for wristwatches when it comes to meeting the relevant aeronautical specifications with a similar durability to comparable on-board instruments. 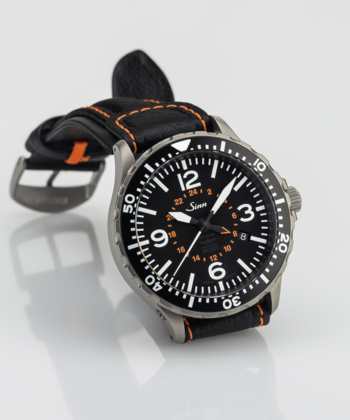 The technical standard for pilot watches (TESTAF) was jointly developed by Aachen University of Applied Sciences (FH) and Sinn Spezialuhren in 2012. The DIN standard builds upon the TESTAF and takes it a step further, upgrading its regulations to the level of a binding standard. The process of developing the DIN standard involved systematically reviewing and implementing aeronautical specifications. The functional requirements of a watch are implemented by EU-OPS, JAR-OPS, CS construction regulations, the third implementing ordinance for the operating regulations for aeronautical equipment (3. DV LuftBO) and FAR regulations, to name just a few examples. The provisions on resistance to external pressures are based on the regulations found in EUROCAE ED-14G and MIL-PRF-46374G, among others. In addition to the aeronautical specifications, watch-specific DIN regulations (such as water resistance, impact protection and accuracy) are also taken into consideration. It is particularly important for the watch and its components (most notably the seals and anti-reflective coating technology) to be resistant to liquids typically found in flight, and this is the first time that this requirement has been introduced for wristwatches. Even the cyclic pressure test, which simulates several thousand changes between the air pressure at sea level and that inside a pressurised cabin, did not exist for wristwatches until now. Ultimately, the DIN ensures safety and compatibility with other pieces of equipment. This includes avoiding magnetic interference with cockpit instruments and avionics, compatibility with night vision devices (in accordance with MIL-STD-3009), avoiding light reflectance, and an exceptionally secure strap fitting. Further considerations of Sinn Spezialuhren are aimed at ensuring that the use of certified DIN pilot watches means if the mandatory, on-board timekeeping equipment should fail or a fault of some kind is suspected, then the flight remains unaffected until the aircraft can be repaired. Sinn Spezialuhren is in talks with manufacturers, design companies, operators and approval authorities to achieve this objective.